As schools have in all earnest re-opened, learning has started. Our children will learn certain things in their classrooms. However, our responsibility to teach does not end with dropping off the child at the school gates. In the home, parents have to set a good example in their conduct and realize that children are good observers of their actions. Parents have to be keen in making sure that their children grow up with sound moral values and not influenced by negative traits picked up here and there, along the way and from amongst peers. The Messenger of Allah Sallallahu ‘alayhi wasallam is reported to have said: Allah Ta’aala will ask every caretaker about the people under his care, and the man will be asked about the people of his household.” (Nasa’i and Abu Dawud) Good upbringing of children in our care is a responsibility and teaching of manners is central to it. 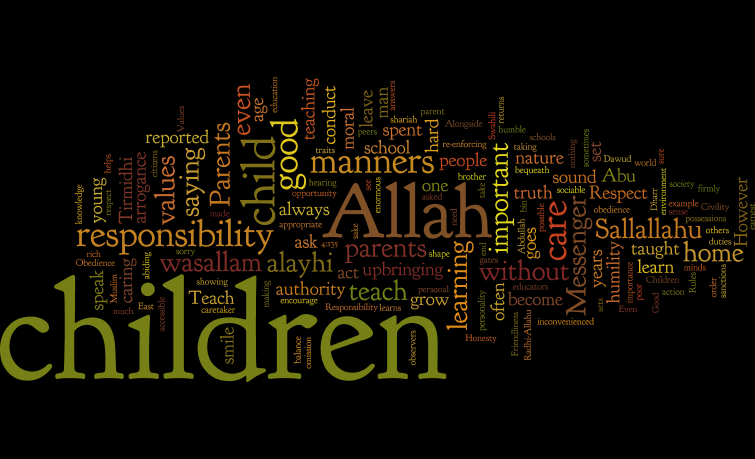 A famous saying of Abdullah bin al-Mubarak (RA) goes: “I spent thirty years learning manners, and I spent twenty years learning knowledge.” In no particular order of importance, below are a selected seven moral values that we can bequeath to our children, yielding returns without measure, insha-Allah. It may sound self-defeating to teach a child humility in an era when a child has to grow in ‘self-belief’ and ‘confidence’. However, humility is about being graceful in achievement without pride and arrogance. It is also about acknowledging that you have shortcomings for which you apologize especially when another has been inconvenienced by your action or omission. Even at a young age, children show interest in performing duties and chores around the home. This has to be encouraged to lay a foundation for taking up more responsibilities of their own personal hygiene, maintaining cleanliness in their own spaces, caring for their possessions and so on. This inculcates discipline and helps to develop a sense of even more responsibility as they become of age. Iblis’s fall from grace was due to his arrogance and disobedience. How often do we see defiance to authority as an act of bravery? “Rules are made to be broken,” so goes the rebel’s refrain. A good parent gives latitude but knows where to draw the line. It is important to remain firm and consistent in re-enforcing obedience by using appropriate rewards and sanctions. Parents sometimes interrogate children in a prosecutorial manner, demanding answers that put children on the defensive. It is important to encourage children to always say the truth by showing that you care and that their honesty and not ‘cover-ups’ leads to solutions that they can be at ease with. Teach children that it is truth that sets one free. In an environment where we teach our children not to ‘speak to strangers’; it is difficult to strike a balance between caution against those who can take advantage of our young ones and being friendly. Regardless, where possible, our children need to be sociable. As educators we shoulder an enormous responsibility of not only imparting education to our learners, but more importantly, to use this opportunity to shape and mould the minds and hearts of those under our care to become vigilant, shariah and law abiding citizens.